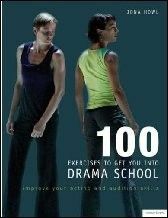 This book gives drama-school hopefuls the inside track only previously available via professional coaches. Competition for entry into drama schools is fierce.This book's greatest asset is its clarity and accessibility it relates to its readers in a helpful and concise way.. It gives clear advice on improving acting skills through effective exercises in which voice movement text and character come together with a single aim: to pass that elusive audition and get your career off the ground.